Dirty Rotten Scoundrels - Do You Remember? 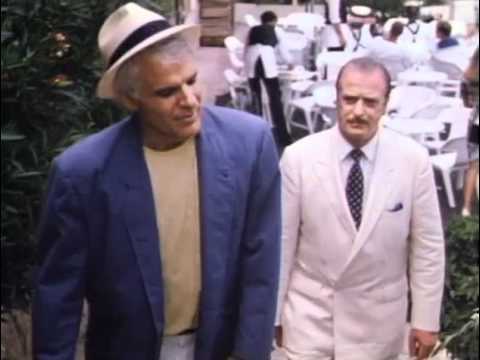 They’re probably not the roles that Steve Martin and Michael Caine would say define their careers, but Freddy Benson and Lawrence Jamieson are certainly memorable, and provide a film’s worth of laughs as continental conmen in 1988’s Dirty Rotten Scoundrels. Caine plays Jamieson, a British swindler working the town of Beaumont-sur-Mer, on the French Riviera. Fleecing rich women via the art of charming seduction is his speciality and he’s helped in his endeavours by not only his servant Arthur (Ian McDiarmid – better known from his appearances in the Star Wars ‘Trilogy’ as Palpatine) but also crooked local police inspector Andre (an understated comic performance by Anton Rogers -Fresh Fields, French Fields, May to December). Lawrence has got it easy, or at least, he has had until now. He reads a newspaper report about ‘The Jackal’, a shadowy American con artist who has recently appeared on the Beaumont-sur-Mer scene and appears to be targeting the same class of wealthy victim as himself although he at first seems unconcerned: “If he’s in the papers, how clever can he be?” Lawrence doesn’t know the identity of his new competitor, but when he meets Freddy Benson, a loud-mouthed fraudster from the U.S., he assumes he’s met his rival. He’s not impressed with Freddy’s inept tactics and decides that he needs to be removed from the area before he frightens off Lawrence’s rich pickings. With the help of Andre, Freddy is arrested on a fake charge and told to leave the country. Before he boards the plane, however, he has a chance encounter with Fanny of Omaha, one of Lawrence’s current marks. Freddy realises that Lawrence is also a hustler - and a better one than Benson himself – and returns to try to persuade Lawrence to teach him the art of the high class confidence trick. Lawrence is, obviously, not keen on this idea but after being threatened with exposure by Freddy he agrees to tutor him and pay him a small percentage of the spoils. It’s not what it seems though; as you’d expect, Lawrence will not be letting Freddy win this one. And so the tutelage begins: Lawrence tries to introduce the uncouth Benson to a more cultured life, with limited success, before making him take on the role of his ‘brother’ Ruprecht in a series of cons. During each scam, Lawrence seduces the female and, once he’s got her money, introduces the socially challenged Ruprecht to the conversation to frighten her away. Freddy is not impressed with the job he has been given; he feels degraded. Now he’s been privy to all Lawrence’s secrets he feels ready to take on the super-rich by himself and informs Lawrence of his intentions. Lawrence is not happy; Beaumont-sur-Mer is not large enough to support two hoaxers and he proposes a bet. They will choose a victim and whoever can con $50,000 out of them will be the one allowed to stay and continue with their swindles. The loser will have to leave the area. Janet Colgate (Glenne Headly) is an American heiress, wide-eyed and innocent. Both Freddy and Lawrence believe that her wealth makes her the perfect mark and they independently begin to plan to relieve her of her money. Freddy plots an elaborate disguise: that of a soldier who lost the ability to walk after he found out his wife cheated on him. He begins to persuade Janet that he is in need of $50k to pay for specialised psychiatric therapy with the esteemed Dr Emil Schaffhausen from Lichtenstein. With Janet seemingly falling for his web of lies Freddy thinks the money, and therefore his right to stalk the over-privileged of the town is in the bag. But what kind of film would it be if Freddy cleaned up now? A very short and not quite so farcical one, that’s what. And so the backstabbing commences. Lawrence uncovers Freddy’s ploy and immediately introduces himself to Ms Colgate as the aforementioned Dr Schaffhausen, who just ‘happens’ to be in town. He explains that he can help Freddy free himself of his affliction, but that she should ensure the $50,000 fee is paid straight to Dr Schaffhausen himself. When Freddy discovers this latest twist he is furious, but continues to play along for the time being. About to claim the money, Lawrence is disturbed when Janet tells him that she in only able to holiday in this wealthy resort because she won a competition and that to pay for Freddy’s therapy she will have to liquidate nearly all her assets. Realising she’s not as rich as first thought and moved by Janet’s kindness towards a man she hardly knows he tells Freddy that the bet is off; they can’t take her money. Determined not to lose the chance to run Lawrence out of town, Freddy decides a new bet is on the cards: the winner will be the first to have his wicked way with the lovely lady instead. Lawrence won’t be part of this (he has some morals, after all!) and proposes that only Freddy try this; if he succeeds, he has won the bet – if he fails he has to get out of town. He’s confident that Janet is not interested in Freddy in that way but, just as a little extra insurance, he decides to put some effort into ensuring the two are not left alone together at any time. Freddy retaliates by roping in a gang of British sailors to intercept Lawrence for a while, so he can pull the big guns on Janet: he is able to walk again because he’s in love with her! And he’s so close – so close to winning her over through a mixture of sympathy and amazement – but Lawrence is there once again to thwart him. As Schaffhausen, he delights in Freddy’s recovery in front of Janet but quickly escorts Freddy out of her hotel room and into the arms of some fairly annoyed sailors. It turns out that they were more than happy to let Lawrence go after discovering he is a Royal Naval Reserves officer and are understandably not too pleased to be taken for a ride by Freddy. They keep him occupied at a party (not too much of a hardship for Freddy, although he realises that he has probably lost the bet) while Lawrence escorts Janet to the airport. He has won – Freddy must leave. It’s not Freddy who turns up at Lawrence’s house to revel in his triumph, but Janet, to cry on Lawrence’s shoulder. She tells him that Freddy stole the money that she had prepared to give him for his therapy, and kind hearted Lawrence gives her $50,000 of his own money to make up for it. He’s cross with Freddy and asks Andre to arrest him, before taking Janet back to the airport. As Janet prepares to board the plane she returns Lawrence’s bag of cash to him, saying she can’t take it from him. As Lawrence watches her plane take off he is interrupted by the police, who are accompanying a bathrobe-clad Freddy. He tells a different story: Janet stole everything he had on him, including the clothes he had been wearing. When Lawrence opens his bag he sees that not only did Janet take the $50,000 after all, but left in its place a short note disclosing that she is, in fact, The Jackal. Freddy is outraged but Lawrence is impressed and has just fallen in love. A week or so later the duplicitous pair are at Lawrence’s villa, analysing how they were taken in by Janet, when a large yacht moors itself alongside. A loud, brash, real estate developer steps off, followed by a group of obviously well-off, potential house buyers. Lawrence and Freddy stand bemused, when all of a sudden they realise that the developer is none other than Janet and she immediately introduces them to her group under new names. Quickly understanding that she is conducting another scam, albeit this time with the two men on side, Lawrence steps smoothly into his newly assigned role. Janet has grasped that Freddy can be a liability and presents him as ‘The whizz kid, Randy Bentwick. Unfortunately Randy is a mute’, which keeps him out of trouble for the moment. As the three lead the group up to the house, no doubt to start the process of alleviating them of their cash, Janet whispers to Lawrence and Freddy. Incredibly (once you have seen the film with Caine and Martin in the title roles), the screenplay for Dirty Rotten Scoundrels was originally planned with David Bowie and Mick Jagger in mind. Hard to imagine either of them taking on the role of Ruprecht to the same degree as Martin did…The film is a rough rewrite of the 1964 movie Bedtime Story, featuring Marlon Brando and David Niven, although the ending in that one goes in a completely different direction. Dirty Rotten Scoundrels picked up a Golden Globe nomination for Caine as Best Actor – Motion Picture Musical or Comedy (losing out to Tom Hanks' utterly believable performance in Big) and Headly was crowned the Chicago Film Critics Association’s Most Promising New Actress. The film also inspired a Broadway musical in 2005, starring John Lithgow as Lawrence and two-time Tony Award winner Norbert Leo Butz as Freddy. Do You Remember Dirty Rotten Scoundrels? Brilliant. I got this for £3 from tesco the other week for another watch, and it's a timeless classic. Steve Martin as 'Ruprech' is just brilliant. Funny from back when movies didn't need to gross you out to be funny.